Today was definitely the calm before the storm pushing on in on Monday, with a flat sea and only a touch of wind. 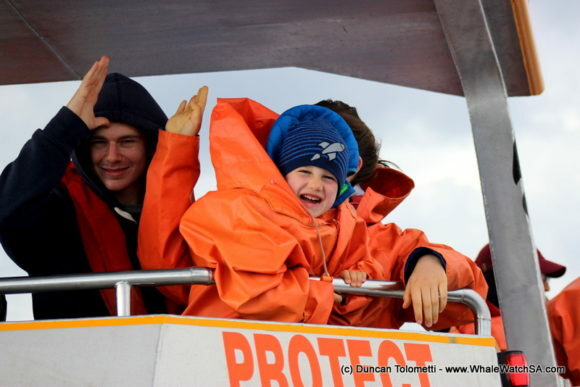 We are however starting to feel some winter chill, so we all bundled up in water and windproof layers in preparation for the day at sea. 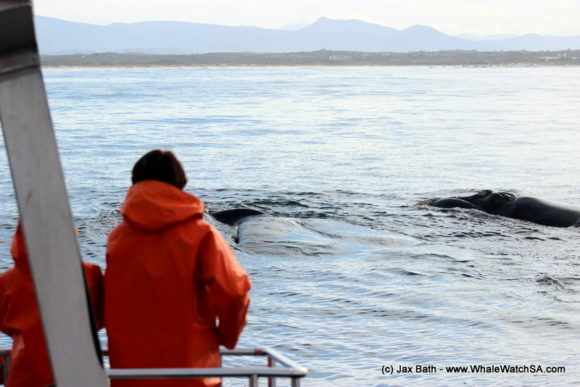 We’ve started to see more whales hanging in the vicinity of Pearly Beach, so we’re starting our trips in this region and working our way back to the bay. To do this, we travel of an extensive reef system spanning from the mainland all the way to Dyer Island. Once we’re over the reef we make our way past the idyllic seaside town and towards their shallow beach section. However, on today’s first tour we didn’t get that far as we spotted a spout of two in slightly deeper water (although 19m can hardly be considered deep). 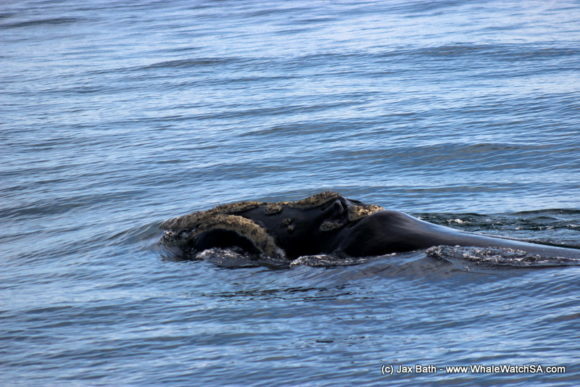 When we approached, we found two adult Southern Right Whales who were lingering in the almost non-existent swell. We watched them fore a few moments before we got to see a tail fluke which Is often an indication of a deeper dive. 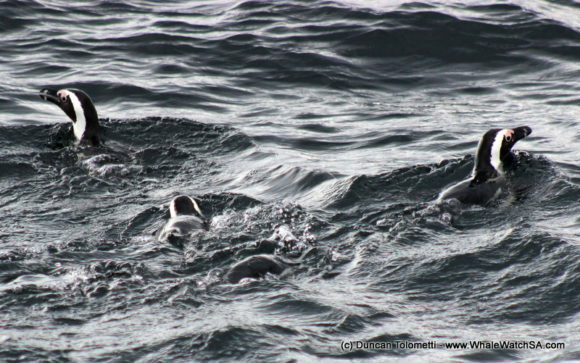 We then sighted them again a few minutes later, as they slowly made their way towards our vessel. 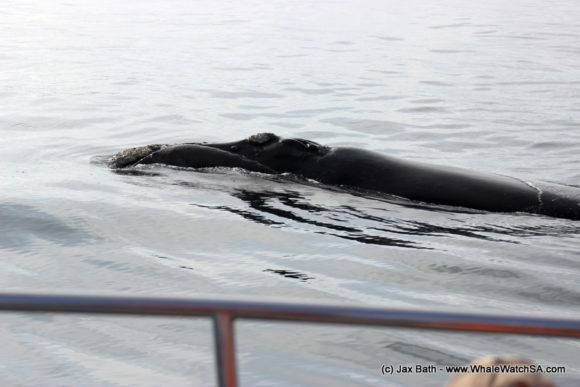 Though these animals continued to dive slightly deeper, very time they came up, they were just a bit closer to the boat. 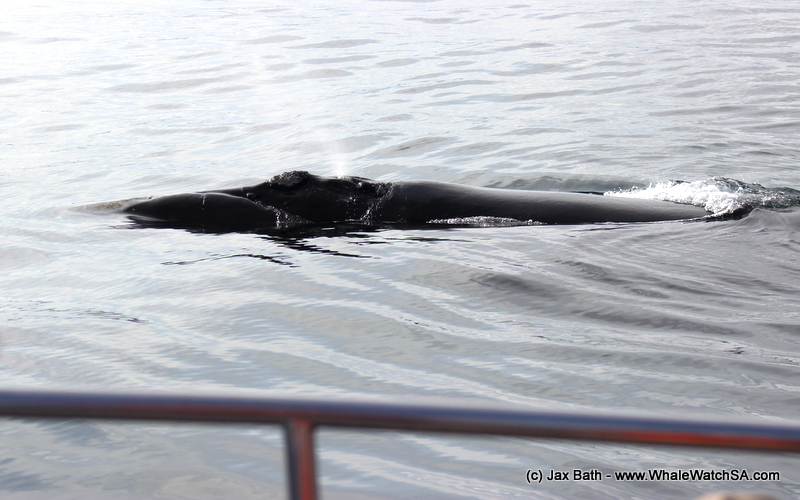 They gave us one close pass from behind before one incredible animal came and lay parallel to the boat less than 1m way. Too close for any of the cameras on board, we watched in awe as this gentle giant lay next to us and exposed his massive tail flukes. This was definitely the sighting of a lifetime! 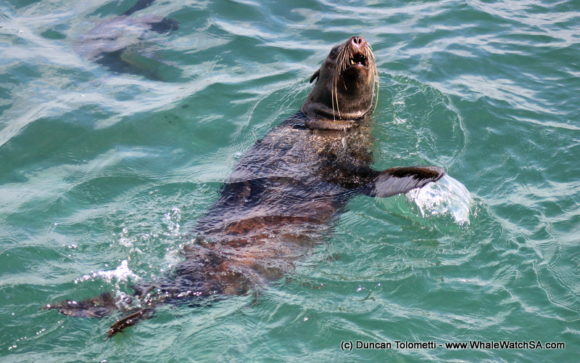 On this tour, we also went on to catch a glimpse of a Great White Shark, an Ocean Sunfish, our Cape Fur Seal colony and some African Penguins. 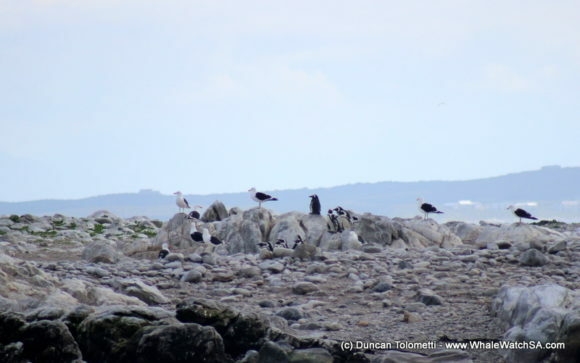 There was a little drama on Dyer Island when we arrived, with something spooking all the birds. This caused the kelp gulls to scatter, the cormorants to do an awkward little run and the Penguins to attempt some waddling before the apparent threat no longer seemed to phase them. 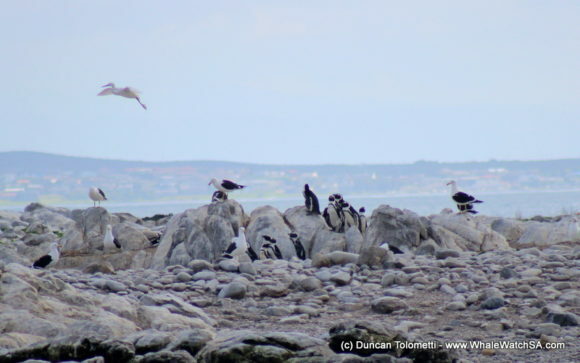 On trip two, we started with an awesome African Penguin sighting. 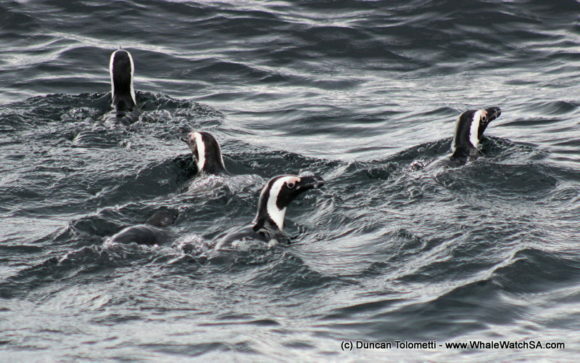 whilst travelling to Pearly Beach, we caught up with a raft of several African Penguins including a baby blue. These little juveniles are always a great addition to our tours, as their dark grey colouration stands in real contrast to their black and white elders. These birds were very relaxed around our boat, coming super close which caused some of the kiddies upstairs to erupt in excitement, which further enhanced the sighting for all on board. This trip also seemed to be a birders paradise, with us finding several Shy Albatross out in the deeper see. We also had countless Sooty Shearwaters, a White Chinned Petrel or two and even a Pesky Sub Antarctic Skua checking out our boat. 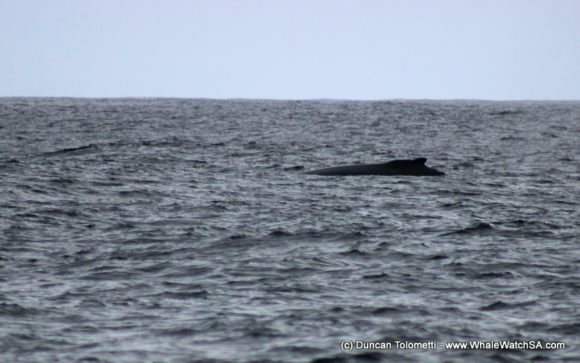 in the open ocean we also got a few views of a migrating Humpback Whale. This whale still has a long way to travel to the breeding grounds and took a couple of deep dives, exposing it’s tail to us before heading off under the water. 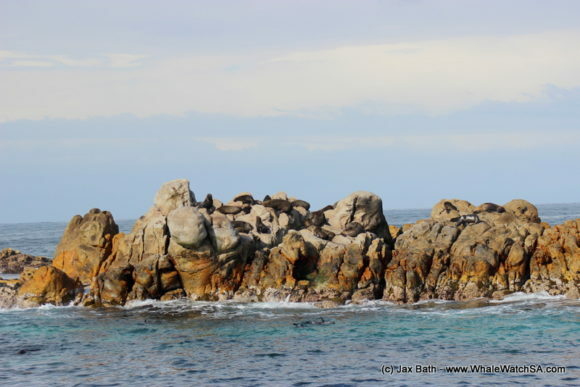 We stopped by our Cape Fur Seal colony and Slashfin next before heading towards Danger Point to see what else the ocean had in store for us. Here, we found a very large Sunfish who came super close to the boat. These animals predate on Jellyfish with their natural predators being sharks, seals and even Orcas. Their fin sometimes looks like that of a shark travelling at the surface, but these guys do not fall into the cartilaginous fish family, they are instead, the largest of all the bony fish in the world. We head back to the harbour after this, finishing the day with some piping hot soup and bread to ward off the cold. 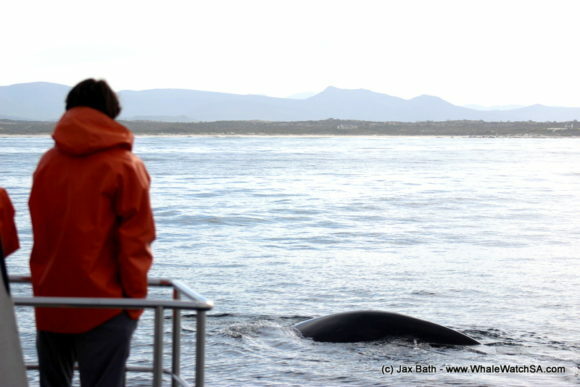 A Humpback Whale in the distance. 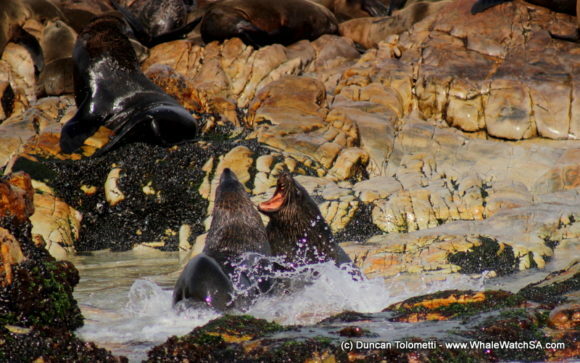 Some Cape Fur Seals having a disagreement. A friendly seal says hi. 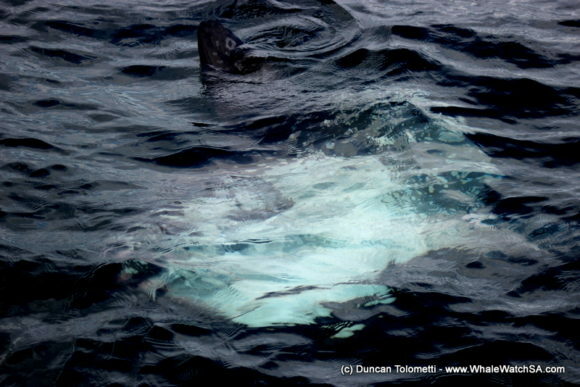 An Ocean Sunfish who came within meters of the boat. 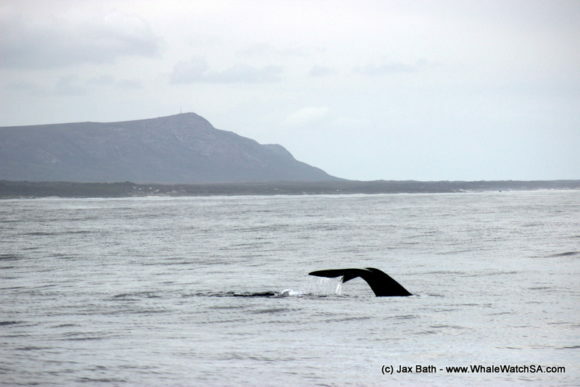 Nothing quite like a whale tail with a view. 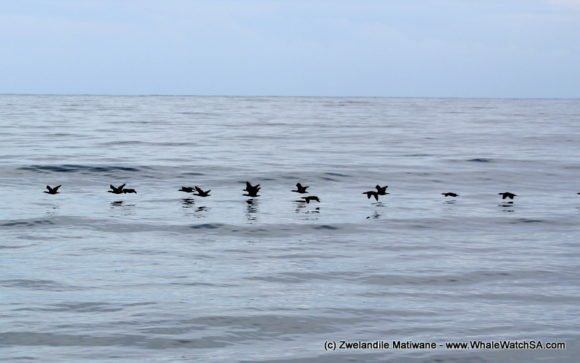 A flock of Cape Cormorants helping each other out by flying in a V-shaped formation. 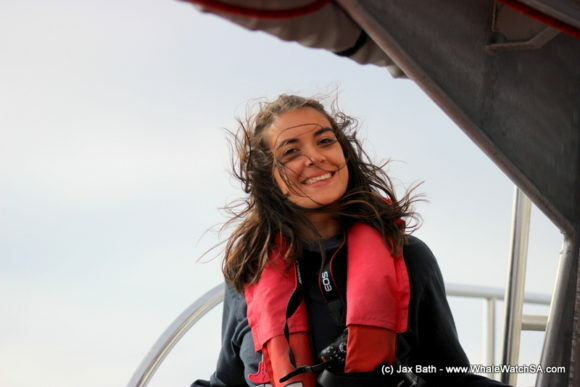 In addition to our volunteer program, we’ve also recently introduced a scientific internship which gives students the opportunity to dive a little deeper into the world of marine biology. Pictured here is one of our interns; Shanelle. A close encounter with a curious creature. 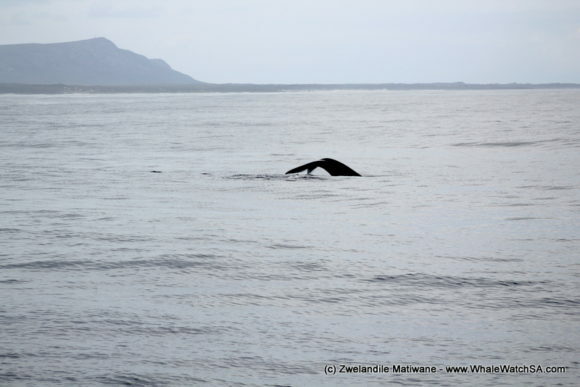 A Client, a Southern Right tail just below the surface and other just behind. A good look at the Southern Right and those distinctive callosities. 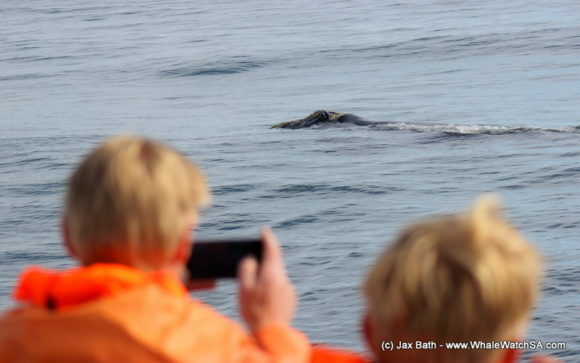 A Southern Right Whale approaching the boat. Hospital Rock, from the old fisherman’s fable. 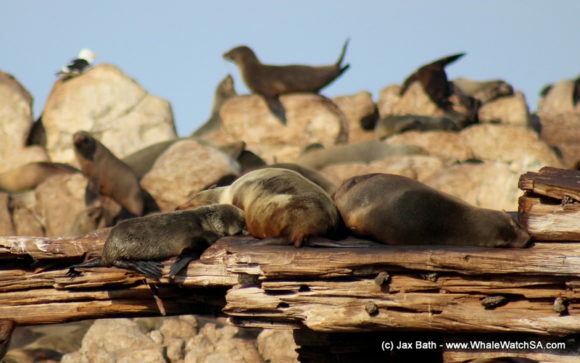 A sleepy pup in the foreground, a flexible fur seal in the back. A monochromatic bird party, including an Egret which we’ve been seeing a fair amount of recently. The bird party once they had settled. A raft of African Penguins. A “Shark Sign” for the camera and a very happy little client.